As the research in the field of skin biology progresses, it becomes more and more clear how big is the influence of the environment and especially solar radiation, on the skin function, skin aging and appearance. The contribution of photo- aging to the skin aging process is enormous. Photo-aging is associated with deep wrinkles, pigmentation and uneven skin tone. The accumulation of knowledge in this area eventually led to stricter regulations for solar products in many countries and especially the demand for much higher protection in the range of UV -A.
UV-A is the range of the longer wave length of the UV radiation (320-400 nm). UV -B is the range of the shorter wave length of the UV radiation (290-320 nm). Although UV-A radiation is less energetic than the UV -B radiation, it is about 95% of the total UV radiation that reaches Earth, its intensity is fairly constant throughout the day, it penetrates through windows and reaches deeper layers of skin ( dermis ) . It has now become clear that UV -A radiation although not causing sunburn, it has a massive contribution in accelerating skin aging and causing severe symptoms in the tissue. UV -B radiation causes direct sunburn and serious damage to the tissue (photoaging, immunosuppression and some cancers) . The protection rate against UV- B is expressed by the Sun Protection Factor (SPF). This value is determined by a clinical trial in which the product is tested for its effectiveness in preventing/delaying the formation of skin reaction (erythema) in humans during exposure to UV radiation. It is important to understand that the sun protection factor (SPF) does not reflect at all the protection rate in the range of UV –A. A separate method is therefore required to express the level of protection in this range. The European regulation defined the UVA-PF (UV -A Protection Factor). This value is determined using special equipment to examine the level of protection in the UV –A range. This method also checks the stability of the filters under UV radiation (photo-stability). Various authorities decided to link the level of protection in the UV -A to the protection level of the product in UV-B. Thus, higher SPF requires also higher protection in the UV -A. In order to ensure an effective broad spectrum protection, the European regulation requires that the protection in UV -A will be at least one third of the claimed SPF of the product. This means that the ratio UVA-PF/SPF should be at least 0.33. 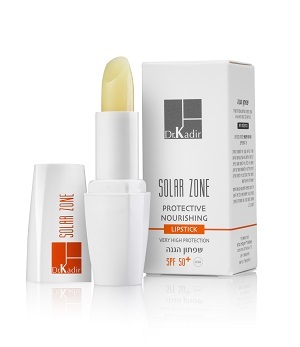 SOLAR ZONE is an advanced series of sun care products with intensified solar protection. The products meet the strict European requirements and even more. As shown in the table, the values UV -A protection and hence UVA-PF/SPF ratio are significantly higher than required by the regulation (by 40% to 135 %). All products were dermatologicaly tested. Cream with very high sun protection factor (SPF far over 60) and very strong protection in the range of UV -A (double than that required by European regulation). Based on the most advanced UV filters including mineral filter. The product has a pleasant skin feel, not heavy and not sticky. Enriched with vitamin E, panthenol and allantoin to provide moisture and care. Cream with high sun protection factor (SPF 50) and strong protection in the range of UV -A (above the required by European regulation). Based on the most advanced UV filters including mineral filter. CC cream is a preparation that combines three actions: 1. High protection against the harmfull range of the sun radiation 2. Correction of skin tone (Color Correction) by effective coverage of the skin with a natural shade which perfectly combines with the natural skin tone . 3. Active ingredients for effective moisturization and regeneration: hyaluronic acid (a highly active moisturizer) and Coenzyme Q10, an anti - oxidant that protects cell membranes from free radicals and allows its proper function. Co - Enzyme Q10 is involved in the process of energy production in the cells and thus increases the vitality of the tissue. Coenzyme Q10 protects the collagen and other proteins that support skin structure by inhibiting the activity of harmful MMP enzymes. In addition, the product is enriched with vitamin E, panthenol and allantoin to provide further care. Product is easily applied to the skin and leaves a soft and pleasant feel. Preparation with high sun protection factor (SPF 30) and strong protection in the range of UV -A (above the required by European regulation). Based on the most advanced UV filters. The product has a pleasant skin feel, not heavy and not sticky. Enriched with vitamin E, panthenol and allantoin to provide moisture and care. Sprable liquid emulsion with a light texture suitable for everyday use. Provides moisturization and high protection against UV-B (SPF 50) and UV-A (above the required by European regulation). Based on the most advanced filters. Enriched with vitamin E, panthenol and allantoin . The product complies with European regulation for water resistance. Sprable liquid emulsion with a light texture suitable for everyday use. Provides moisturization and high protection against UV-B (SPF 30) and UV-A (more than double above the required by European regulation). Based on the most advanced filters. Enriched with vitamin E, panthenol and allantoin . The product complies with European regulation for water resistance. Optimal protection of the lips during all seasons – cold and warm. 1. The Stratum Corneum (the horny layer) of the lips skin is very thin (includes a small number of layers). 2. There are no hair follicles and sebaceous glands on the lips. 3. There are considerably less melanocytes (the cells that synthesize the pigment melanin). The lips pink shade results from the blood vessels under the skin, which is thin and contains low amount of pigments. Furthermore, the lips are rich with sensorial receptors and nerves endings, thus, it is a sensitive zone. All these characteristics make the lips more sensitive to environmental factors such as moisture, temperature, weather conditions and UV irradiation. The lips are also sensitive to irritating materials such as some spices. The lips tends to become dry and chapped. As the lips are frequently exposed to the sun and contain lower amounts of melanin, UV irradiation damages the lips, causing collagen deterioration, wrinkles, premature aging and sometimes even more severe disorders. Oil Calendula: Calendula (MARIGOLD) has been used for centuries as a medicinal herb to treat many skin conditions. Its useful activity is due to the content of active substances, flavonoids and carotenoids that give the oil its golden orange color. These active substances restore, regenerate, sooth and protect the skin. Due to their activity as antioxidants, they also protect the tissue against the damage of free radicals and UV irradiation. Shea Butter: Shea butter effectively moisturizes the skin due to high content of triglycerides rich in oleic acid. Shea Butter is also rich in linoleic acid (omega 6) which contributes to the proper functioning of the skin barrier that keeps the skin moisture and reduces penetration of harmful substances. In addition, Shea butter contains fractions of bioactive substances (triterpenes) that contribute to the renewal of collagen and reduce its degradation. These substances are active in minimizing aging processes and wrinkles formation in the tissue. They protect the tissue against free radicals, against UV damage and have soothing action. Vitamin E: Vitamin E has a wide range of beneficial effects on the skin: it increases the level of moisture in the skin, it stimulates tissue regeneration and soothes the skin. Vitamin E is an effective antioxidant that protects the tissue from the damage of free radicals and UV irradiation. The product contains a high concentration of vitamin E ( 5% tocopheryl acetate) in order to increase the its effectiveness to restore damaged lips. Due to the above combination of active ingredients, this product protects the lips against dryness, cracks, and other unwanted conditions. In addition, the product contains a special combination of effective sunscreens that provide very high protection factor of 50+ (according to Israeli and to European Standard, a product must demonstrate a protection factor of at least 60 in order to be marked 50+). The product also provides high protection in the UV-A range in accordance with the Israeli and European standards. The high concentrations of active nourishing ingredients, the efficient sunscreens, the pleasant texture and the clinically proven suitability for sensitive skin puts this product in the first line of lip protecting products. Cream with high sun protection factor (SPF 30) and strong protection in the range of UV -A. Based on the most advanced UV filters including mineral filter. BB cream is a preparation that combines three actions: 1. Active hydration with hyaluronic acid 2. Effective sun protection. 3.Correction of skin tone by effective coverage of the skin with a natural shade which perfectly combines with the natural skin tone. In addition, the product is enriched with vitamin E, panthenol and allantoin to provide further care. Product is easily applied to the skin and leaves a soft and pleasant feel. **Should be at least 0.33 according the European recommendation for UV-A protection. ***Complies with the European recommendation for water resistance.